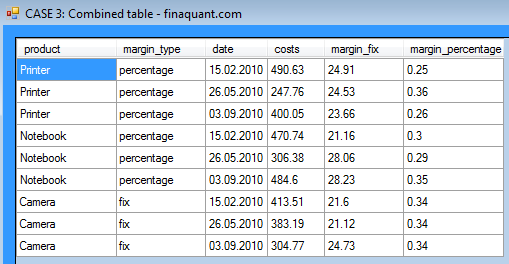 Even though quite easy to understand and use, TransformRowsDic()1 in the free .net library finaquant® protos is one of the most versatile and useful table transformation functions. This table function offers a simple way for applying user-defined formulas on each row of a table. derive the value of a field of a table in terms of other related fields. apply logical and mathematical operations on some fields of table. Following examples illustrate how TransformRowsDic() can be used in practice for the purposes listed above. All the examples start with the TestTable below as the primary input parameter2. price = (1 + margin_percentage) x costs, for products "Printer" and "Notebook"
price = margin_fix + costs, for product "Camera"
// - price = (1 + margin_percentage) x costs, for products "Printer" and "Notebook"
// - price = margin_fix + costs, for product "Camera"
// Note: price depends on some other key figures and text attribute "product"
Note that the condition logic (i.e. which formula is to be applied for which products) is hard-coded in the example above. The following example shows, how the same problem could be solved in a more elegant way, by defining the margin type (fix or percentage) for each product as a table parameter. 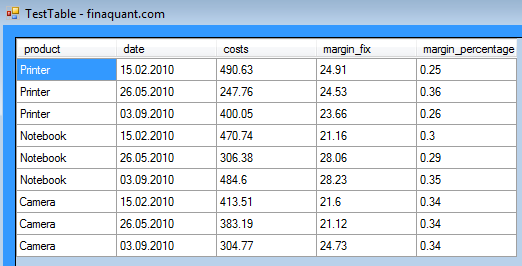 Beside implementing a more parametric and flexible approach compared to the second example above, this example also illustrates the practical use of combining tables in order to gather all relevant parameters in a single table. This entry was posted in Calculation engine and tagged .net library, calculation engine, table functions. Bookmark the permalink.